The 500T Mechanical Stationary has a maximum payload of 14,000 lbs (6,350 kg), struck capacity of 480 ft³ (13.6 m³) or 555 ft³ (15.7 m³) with tub extension, and requires 75 horse power (56 kW). The 500T is also available as a pull type and as a truck mount mixer. The 1400T Mechanical Stationary has a maximum payload of 40,000 lbs (18,144 kg), struck capacity of 1,157 ft³ (32.8 m³) or 1,312 ft³ (37.2 m³) with tub extension, and requires 250 horse power (186 kW). The 1400T is also available as a pull type and a truck mount. The 300 Mechanical Stationary has a maximum payload of 6,000 lbs (2,722 kg), struck capacity of 235 ft³ (6.7 m³) or 278 ft³ (7.9 m³) with tub extension, and requires 50 horse power (37 kW). This model has a mechanical drive. All stationary models are equipped with end door and fixed chute for easy unloading of mixed wet or dry commodities. Various pedestal heights are available to fit each operation’s requirements. The 400 Mechanical Stationary has a maximum payload of 10,000 lbs (4,536 kg), struck capacity of 321 ft³ (9.1 m³) or 378 ft³ (10.7 m³) with tub extension, and requires 50 horse power (37 kW). This model has a mechanical drive. All stationary models are equipped with end door and fixed chute for easy unloading of mixed wet or dry commodities. Various pedestal heights are available to fit each operation’s requirements. The 400 is also available as a pull type mixer. 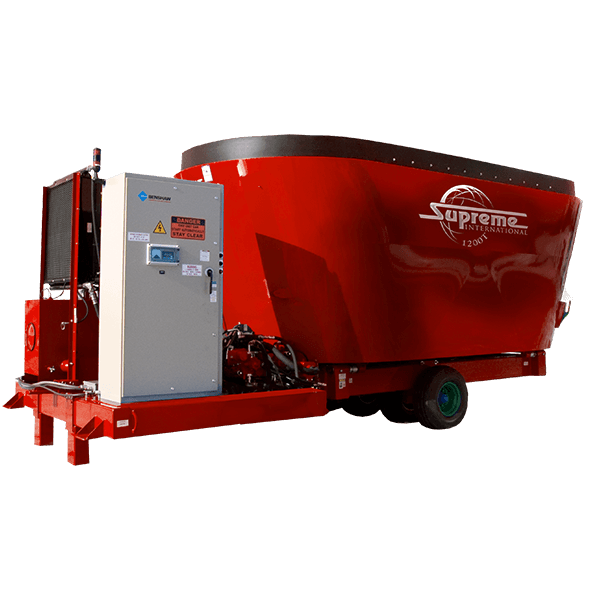 The 500 Mechanical Stationary has a maximum payload of 14,000 lbs (6,350 kg), struck capacity of 398 ft³ (11.3 m³) or 462 ft³ (13.1 m³) with tub extension, and requires 75 horse power (56 kW). This model has a mechanical drive. 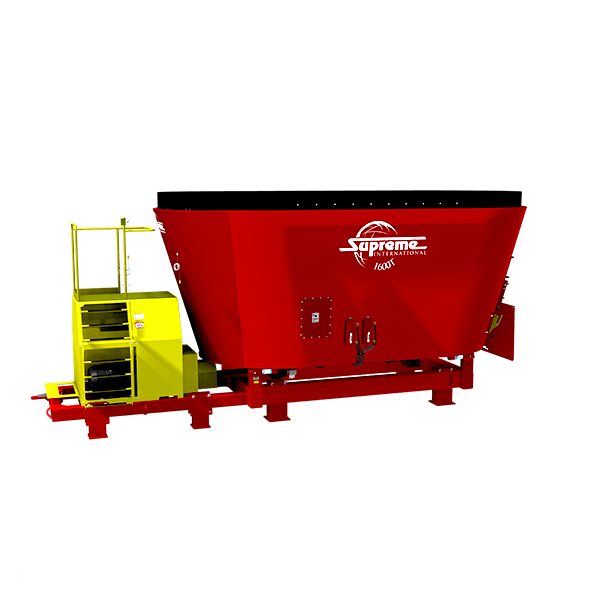 All stationary models are equipped with end door and fixed chute for easy unloading of mixed wet or dry commodities. Various pedestal heights are available to fit each operation’s requirements. 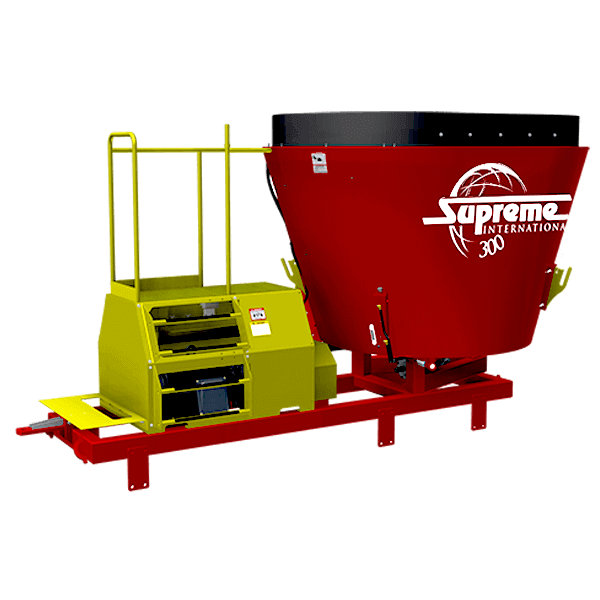 The 500 is also available as a pull type mixer. The 500T Mechanical Stationary has a maximum payload of 14,000 lbs (6,350 kg), struck capacity of 480 ft³ (13.6 m³) or 555 ft³ (15.7 m³) with tub extension, and requires 75 horse power (56 kW). This model has a mechanical drive. All stationary models are equipped with end door and fixed chute for easy unloading of mixed wet or dry commodities. Various pedestal heights are available to fit each operation’s requirements. The 500T is also available as a pull type and as a truck mount mixer. 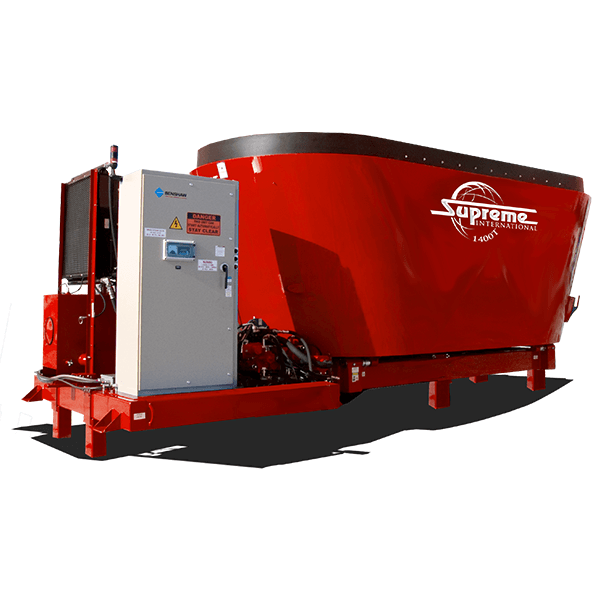 The 600 Mechanical Stationary has a maximum payload of 14,000 lbs (6,350 kg), struck capacity of 469 ft³ (13.3 m³) or 537 ft³ (15.2 m³) with tub extension, and requires 75 horse power (56 kW). This model has a mechanical drive. All stationary models are equipped with end door and fixed chute for easy unloading of mixed wet or dry commodities. Various pedestal heights are available to fit each operation’s requirements. The 600 is also available as a pull type. The 700T Mechanical Stationary has a maximum payload of 14,000 lbs (6,350 kg), struck capacity of 568 ft³ (16.1 m³) or 649 ft³ (18.4 m³) with tub extension, and requires 100 horse power (75 kW). This model has a mechanical drive. 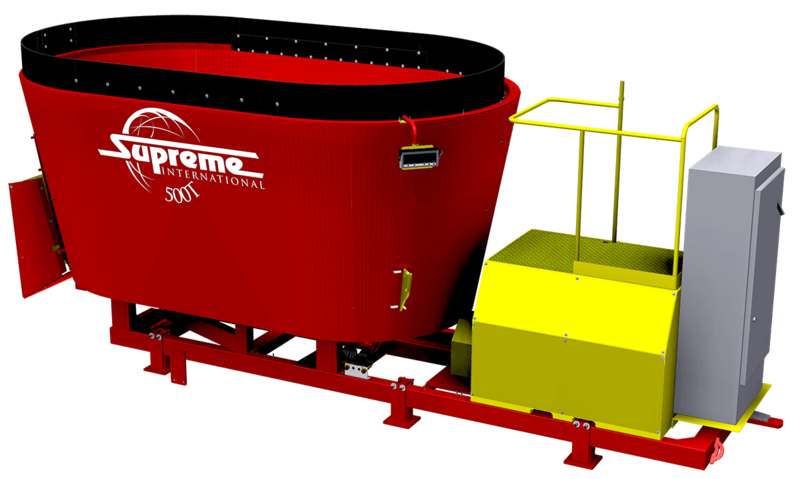 All stationary models are equipped with end door and fixed chute for easy unloading of mixed wet or dry commodities. Various pedestal heights are available to fit each operation’s requirements. The 700T is also available as a pull type and as a truck mount. The 900T Mechanical Stationary has a maximum payload of 24,000 lbs (10,886 kg), struck capacity of 739 ft³ (20.9 m³) or 849 ft³ (24.0 m³) with tub extension, and requires 125 horse power (93 kW). This model has a mechanical drive. All stationary models are equipped with end door and fixed chute for easy unloading of mixed wet or dry commodities. Various pedestal heights are available to fit each operation’s requirements. The 900T is also available as a pull type and as a truck mount. 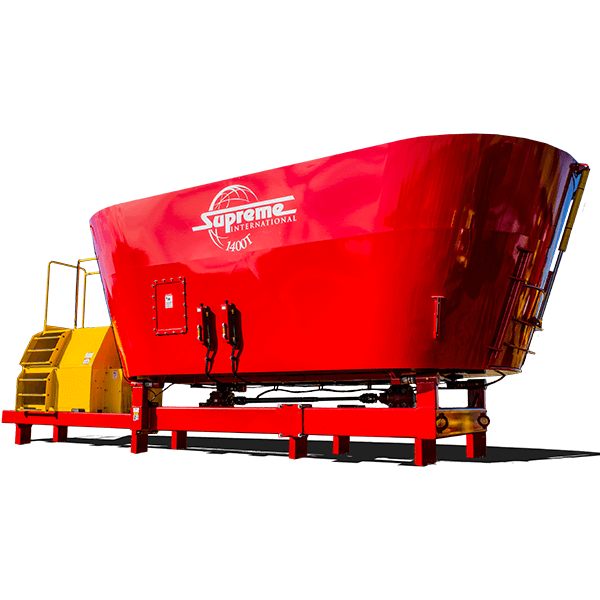 The 1200T Mechanical Stationary has a maximum payload of 40,000 lbs (18,144 kg), struck capacity of 933 ft³ (26.4 m³) or 1072 ft³ (30.4 m³) with tub extension, and requires 200 horse power (149 kW). This model has a mechanical drive. All stationary models are equipped with end door and fixed chute for easy unloading of mixed wet or dry commodities. Various pedestal heights are available to fit each operation’s requirements. The 1400T Mechanical Stationary has a maximum payload of 40,000 lbs (18,144 kg), struck capacity of 1,157 ft³ (32.8 m³) or 1,312 ft³ (37.2 m³) with tub extension, and requires 250 horse power (186 kW). This model has a mechanical drive. All stationary models are equipped with end door and fixed chute for easy unloading of mixed wet or dry commodities. Various pedestal heights are available to fit each operation’s requirements. The 1400T is also available as a pull type and a truck mount. 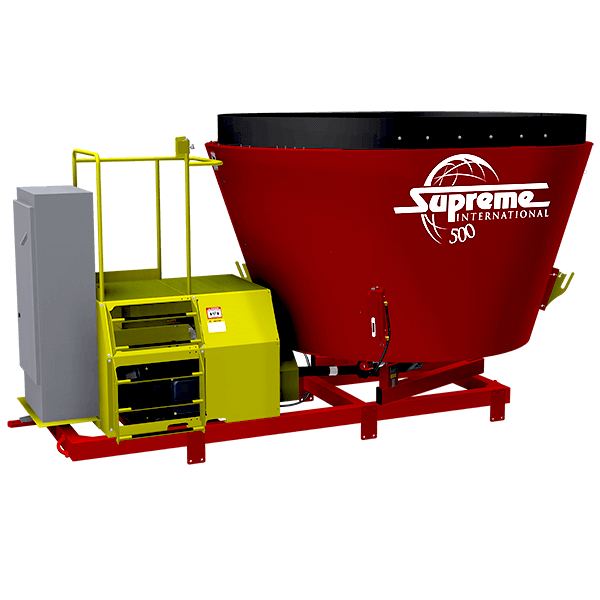 The 1600T Mechanical Stationary has a maximum payload of 40,000 lbs (18,144 kg), struck capacity of 1,325 ft³ (37.5 m³) or 1,480 ft³ (41.9 m³) with tub extension, and requires 300 horse power (224kW). This model has a mechanical drive. All stationary models are equipped with end door and fixed chute for easy unloading of mixed wet or dry commodities. Various pedestal heights are available to fit each operation’s requirements. The 1600T is also available as a pull type and a truck mount. The 1700TR Mechanical Stationary has a maximum payload of 40,000 lbs (18,144 kg), struck capacity of 1398 ft³ (39.6 m³) or 1585 ft³ (44.9 m³) with tub extension, and requires 250 horse power (186kW). This model has a mechanical drive. All stationary models are equipped with end door and fixed chute for easy unloading of mixed wet or dry commodities. Various pedestal heights are available to fit each operation’s requirements. The 1700TR is also available as a pull type. The 1200T Hydrostatic Stationary has a maximum payload of 40,000 lbs (18,144 kg), struck capacity of 917 ft³ (26 m³) or 1038 ft³ (29.4 m³) with tub extension, and requires 200 horse power (149 kW). This model uses hydrostatic drive which is more efficient compared to mechanical drive stationaries. All stationary models are equipped with end door and fixed chute for easy unloading of mixed wet or dry commodities. Various pedestal heights are available to fit each operation’s requirements. 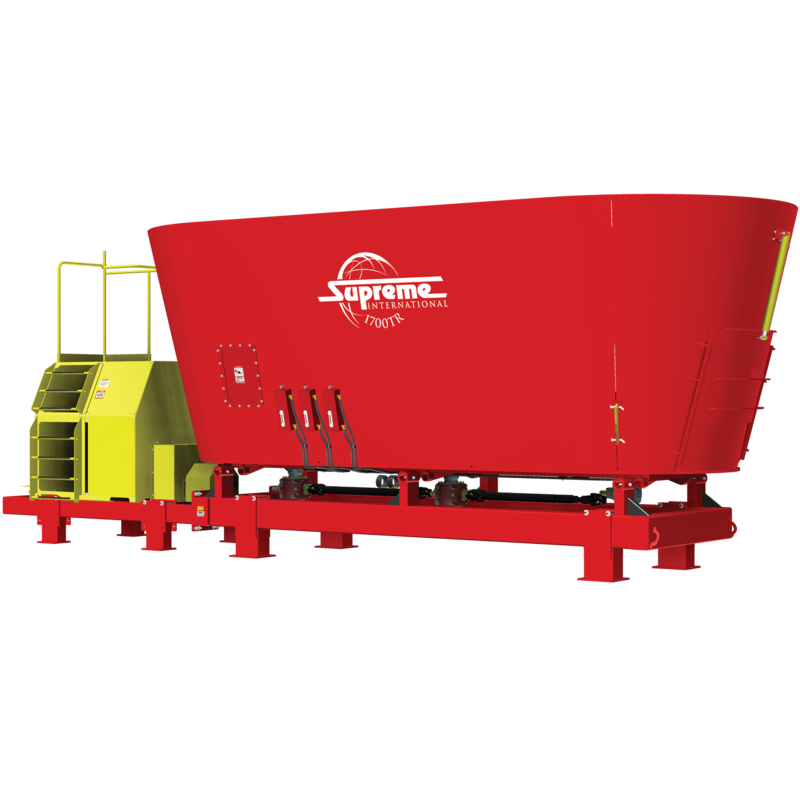 The 1400T Hydrostatic Stationary has a maximum payload of 40,000 lbs (18,144 kg), struck capacity of 1,157 ft³ (32.8 m³) or 1,312 ft³ (37.2 m³) with tub extension, and requires 250 horse power (186 kW). This model uses hydrostatic drive which is more efficient compared to mechanical drive stationaries. 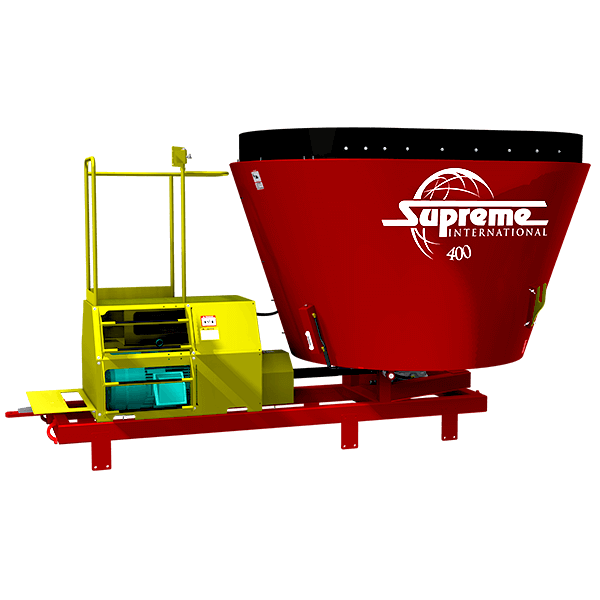 All stationary models are equipped with end door and fixed chute for easy unloading of mixed wet or dry commodities. Various pedestal heights are available to fit each operation’s requirements.